You never know when you might need to perform a clean install of Windows 8 or any other OS, for that matter. PC experts recommend performing a clean install every six months for maximum functionality on a computer. With the release of Windows 8, Microsoft introduced several new features to make the process easier. But for some, they still want to be able to do a clean install. Here’s how to do it. 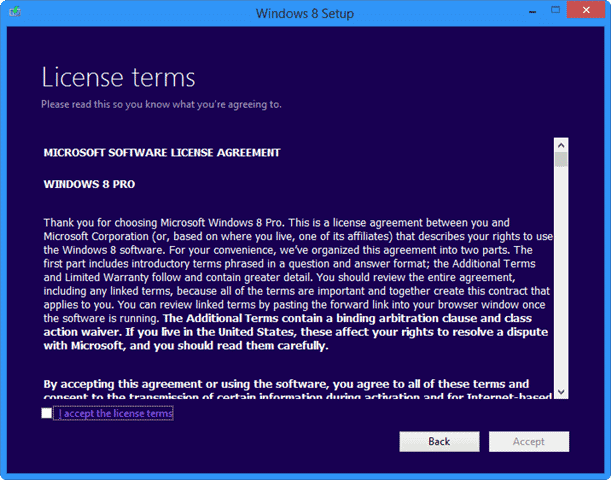 These steps will work for Windows 8 and Windows 8.1. 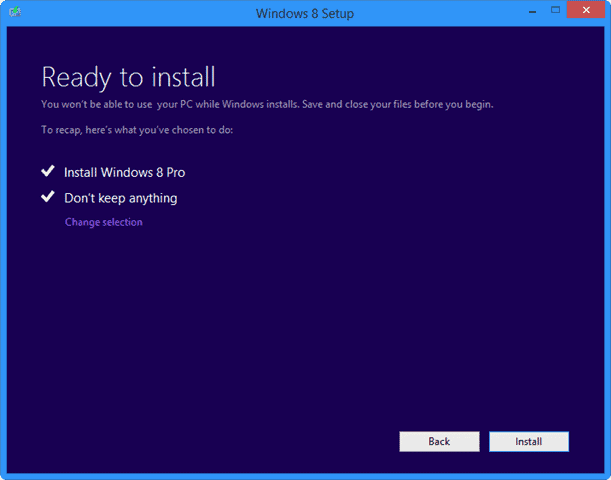 The instructions are for Windows 8 but don’t vary much for Windows 8.1 clean installs. Before you begin, make sure to backup everything you want to bring with you on the clean install. This includes files, pictures, videos, and folder structure. You can use removable media or the cloud for this purpose but make sure you do it before you begin. Once you reach the point of no return, there’s no recovering anything you’ve left behind. When you’re ready, use your DVD media or USB media to start the clean install of Windows 8. You can pop either it in and let auto-play start, or double-click either installation type to get started. A Windows 8 pop-up will appear letting you know the process has started. 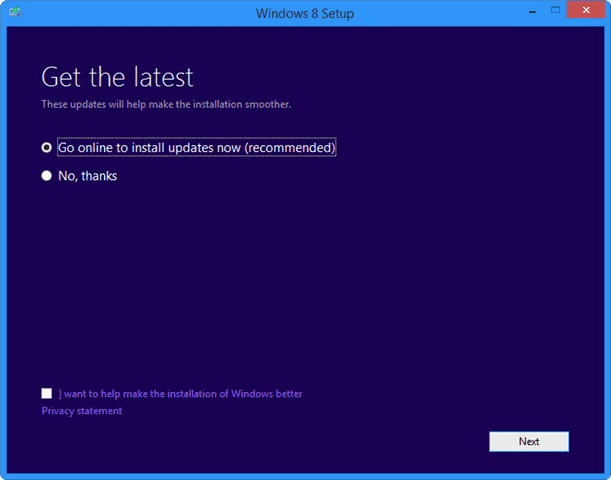 You’ll be prompted to get updates to Windows 8 before you begin the installation process. This is essential to get the latest version of the Windows 8 installer. If you want to help Microsoft make the installation process easier on consumers, check the box next to “I want to help make the installation of Windows better.” It’s not mandatory, so it’s up to you. Click “Go online to install updates now (recommended)” and then click “Next” to continue. 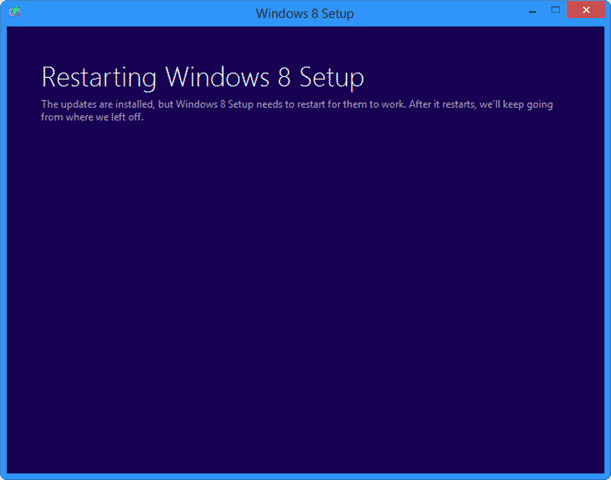 Once the updates to the installer are downloaded and applied, the Windows 8 setup will need to restart. This’ll automatically happen and relaunch when ready. Now, you’ll be prompted to enter your Windows 8 product key. 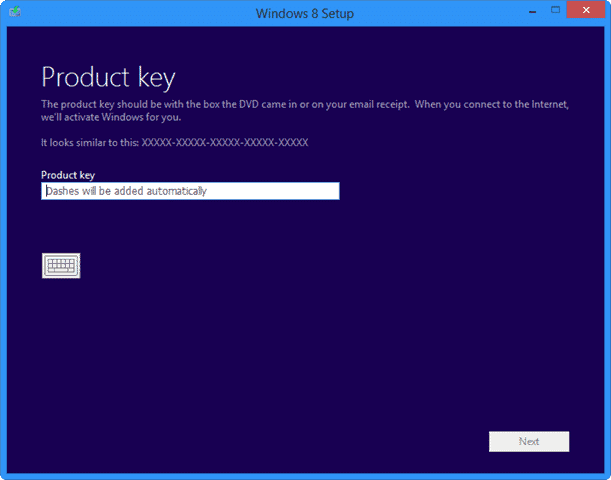 Enter your Windows 8 product key and Microsoft will validate it. When ready, click “Accept” to move forward. You’ll only have one choice of what to keep. Click “Next” again. You’ll be given a rundown of what will occur during the clean install of Windows 8. Windows 8 will then begin the installation process. This can take anywhere from 15 minutes to 90 minutes depending on the age of your computer. Sit back, relax and wait for the installation to finish. You’ll see your PC automatically restart several times during the process, this is normal. Once the Windows 8 clean install process begins, you can’t stop it. Make sure your PC is plugged into its power source and let it run. If your PC shuts off during the process, you could corrupt the installation and have to start over again. When the Windows 8 installation process is finished, you’ll be able to customize your computer. Everything from the PC name to the color scheme and connecting it to a Microsoft Account will be at your fingertips. You can either make these the same or change things up, it’s up to you. 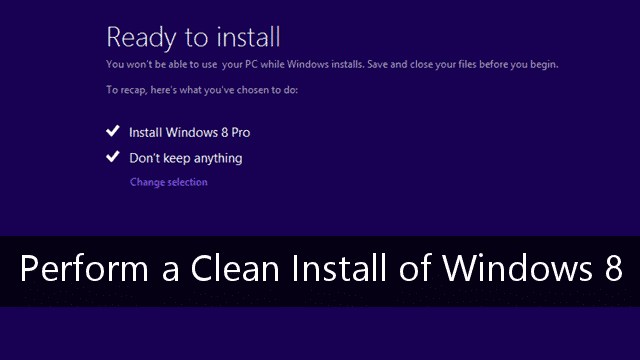 A clean Windows 8 installation lets you start fresh. Any changes you’ve made to the PC from installing and uninstalling software to registry edits to other tweaks will be gone. You will be surprised by how much quicker your computer responds and runs, along with how much smoother it is to do things. This is one of the reasons why PC experts have recommended the clean install process dating back to Windows 98. A clean install of Windows 8 is one of the most beneficial ways you can get more from your PC, especially if you’ve been running Windows for a long time and have never performed one before. Windows 8 may have introduced refresh, restore and recovery to give users a way to get some functionality back to their OS. However, some users still prefer a good old-fashioned clean install. If you’re one of those PC users, now you know how to do it with Windows 8 and Windows 8.1. The process is easier than ever with the introduction of Windows 8 and the easy to make recovery media that comes with the OS.